LIPOCUT is used to treat obesity in people with a body mass index (BMI) more than 30. It can also be used to treat obesity in people with diabetes, high blood pressure or high cholesterol and a BMI more than 27. LIPOCUT works by preventing your body from absorbing the fat in the food you eat. Fat that is not absorbed is passed out from your body in the stools. LIPOCUT is meant to be taken as part of a complete weight management programme that should include exercise, a healthy diet and other lifestyle changes. 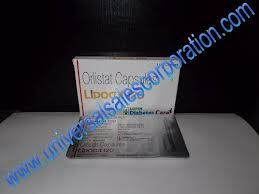 Unbelievable price on LIPOCUT 120MG CAPS in Mumbai (India) company Euphoria Healthcare Pvt. Ltd..
© Euphoria Healthcare Pvt. Ltd.